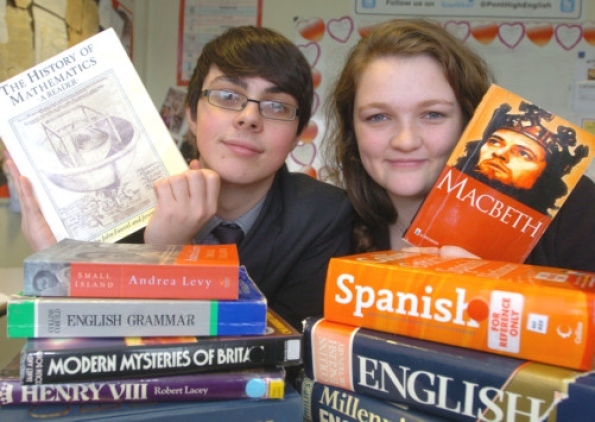 win a national award for their academic success. TWO Ponteland High School students have been recognised for their achievements and dedication both in and out of school. Jonathan Lakey and Bryony Clear Hill received runner-up prizes in the inaugural Lord Glenamara Memorial Awards. The ceremony took place at Imperial College, London and the accolades were presented by the Secretary of State for Education Michael Gove. Bryony is studying maths, biology and geography at A-Level, having gained A grades at AS-Level in all three subjects. She recently received an offer from Oxford University to read geography. The 18-year-old is planning a gap year to work as an English teacher for the Project Trust in the Dominican Republic, which will build on expertise gained during four weeks volunteering at an orphanage in Jodhpur, India, last year. She also travelled around Rajasthan seeing first hand the positive impact of education. Most of the funding for her past and future trip has come through her part-time work as a waitress. The Year 13 student regularly helps younger pupils in lessons and in her role as school Vice President (community) she organises the prefect system and speaks at different events. In addition, she plays the cello and performs locally and abroad as part of a folk orchestra. “Neither of us were expecting to get an award so it came as quite a shock,” she said. “It was great to meet Mr Gove and some former Secretaries of State for Education at the ceremony, particularly Shirley Williams as I had a decent conversation with her. “When I was in India, a girl from Canada and I volunteered at an orphanage which looked after disabled children and we did lots of activities with them. “One of the main things that stuck in my mind was a five-year-old blind boy, who was the size of a typical two-year-old in the UK. “It was an amazing experience and when we gave the children some toys that the orphanage would not be able to afford, it was fantastic to see how much of a difference it made to them. Fellow Year 13 student Jonathan gained A grades at AS-Level in maths, chemistry and physics and he continues to study these at A-Level, along with further maths. He hopes to go on to university to read engineering. At school, he has supported and encouraged younger students in the STEM club as they designed and built model rollercoasters and robots. The 17-year-old is a member of the Scouts and has taken part in the Tall Ships race from Norway to Hartlepool and was on the Explorer Belt expedition in the Crimea region of the Ukraine last summer. He is currently working towards his gold Duke of Edinburgh award, having gained bronze and silver, and plays the trumpet in the county band. “It was a nice surprise to do so well in these awards,” he said. “The school gives us a lot of opportunities to get involved in extra-curricular activities and without them I wouldn’t have been nominated for the awards. Both Jonathan and Bryony were among the Ponteland High School team which participated in the national session of last year’s European Youth Parliament debating competition after winning the regional heat. Headteacher Kieran McGrane said: “It is always nice when fantastic students receive awards and Bryony and Jonathan both deserve this recognition. The awards were set up in memory of Lord Glenamara, who was a headteacher in Blyth before becoming an MP and he later served as Education Secretary under Harold Wilson. At the time of his death in May 2012, the 99-year-old was the longest serving member of the House of Lords.